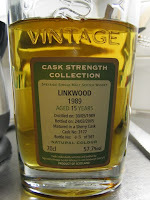 The only other Linkwood I have yet had on the mission (Malt Mission #60) was from an independent bottler and as Linkwood lost out to Cragganmore as the Speyside representative in Diageo's Classic Malts range back in 1989, there has never been a widely available official bottling, Flora & Fauna being the sole standard proprietary release. (Just look at this list!) So Linkwood has been a darling distillery of independent bottlers (especially Gordon and Machpail) and blenders from Johnnie Walker to John Glaser since it was built in 1821. Time is tight this week. Sorry these recent posts have been so lame. Totally breakfast, not full English, but nuts and healthy seed mix, oats, oily and slightly dairy... yogurt. Rotting apples on the grass, full and almost farmy. Potato chips/crisps, apple cider vinegar, stock bone, and a tired sherry sweetness. Sweet and sour with a HOT impact. Churned butter, late toasty effect like crunchy bits of well roasted potatoes. Ends lactic and creamy with some vanilla and oak. Great body throughout, in the nose and on the palate. Perhaps a bit young (hard and hot) but more time in the cask might have allowed the sourness to dominate and become butyric. A risk the folks at Signatory apparently decided not to take. No idea where you can find this bottle today, but thanks to Tommi for sharing it! Kippis!